An instant rebate of $30 off the regular sale price has been applied! Price shown reflects price after rebate. Offer valid only through May 31! Mackie Big Knob Studio combines premium 192 kHz/24-bit recording with the proven performance of the world's bestselling monitor controller. Capture world-class recordings via dual Onyx preamps and professional studio features like zero-latency overdubbing and built-in talkback for artist communication. 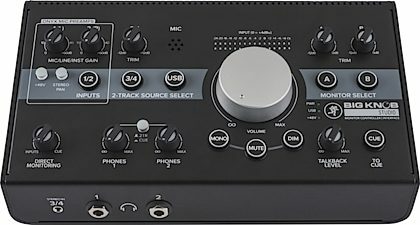 Easily select from three sources, including USB playback from your DAW and switch between two pairs of studio monitors. Only Big Knob Studio ensures balanced listening levels, offering independent gain trim on all inputs and outputs. Two separate headphone outs are available, each with separate level control. Plus, there's even a handy front-panel input for your smartphone. Big Knob Studio is the ultimate compact studio solution -- just add monitors.